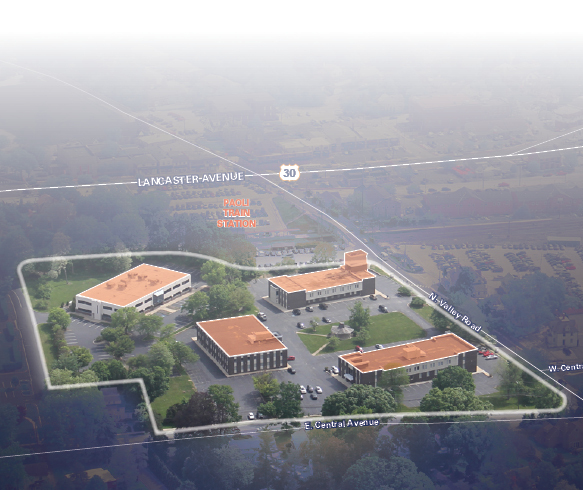 In early 2014, Home Properties, a Philadelphia-based developer proposed a 250+-unit multifamily building with structured parking plan for Station Square, the 7.475 acre commercial site at the corner of Central and North Valley Roads in Paoli, owned by the Palmer Group Properties. Although the current Town Center District zoning allows for 135 apartments on the property by right, the developer sought approval for greater density. The proposed 4-story apartment complex was viewed as a radical change for the immediate community and concerns were raised as to whether this high density project was a good fit for the neighborhood. Major issues surrounded the proposed project, including increased traffic, density, height, change to the character of the neighborhood, impact on school district, public safety, etc. Ultimately, faced with many unanswered questions from the Planning Commission and major pushback from the local residents, the proposed 2014 redevelopment plan quietly disappeared. The Station Square office building complex remained for sale with a $9 million listing price and the tenants on month-to-month leases. On April 21, 2016, Linden Lane Capital Partners appeared before the Planning Commission to present a new redevelopment plan for the Station Square complex. Following a lengthy discussion and public comment period, no action was taken by the Planning Commissioners and the application received an extension until the May meeting. On Thursday, May 19, Linden Lane Capital Partners will present its conditional use application for the redevelopment of Station Square to the Planning Commission. The proposal is to construct three new mixed-used buildings, with structured and surface parking. Uses include apartments and rental space for office, retail and/or personal services. Linden Lane is seeking a recommendation from the Planning Commission for approval by the Board of Supervisors. Upon recommendation (for approval or denial), Linden Lane will appear before the supervisors for a Conditional Use Hearing. In 2014, residential neighbors of Station Square were successful in their efforts opposing the proposed multi-story apartment complex. Knowing that increased traffic in their neighborhood was a major concern for Paoli residents, the 2016 redevelopment plan seeks to address those concerns. According to the conditional use application, the developer will work with the township and the PA Department of Transportation to mitigate the traffic issues although no specifics are given. With respect to the parking, the applicant intends to provide for a minimum of 75% of the required parking with a structured parking facility.